Millets are very hardy crops that grow even in extreme conditions. And like any agricultural product from hardy plants, millet grains are packed with an amazing array of nutrients. Its not just one ! : As one can see from the highlights, each millet is good from one nutrient component’s perspective or the other. So, adding millets into one’s diet will inherently nurture diversity – on the plate and in the farms. 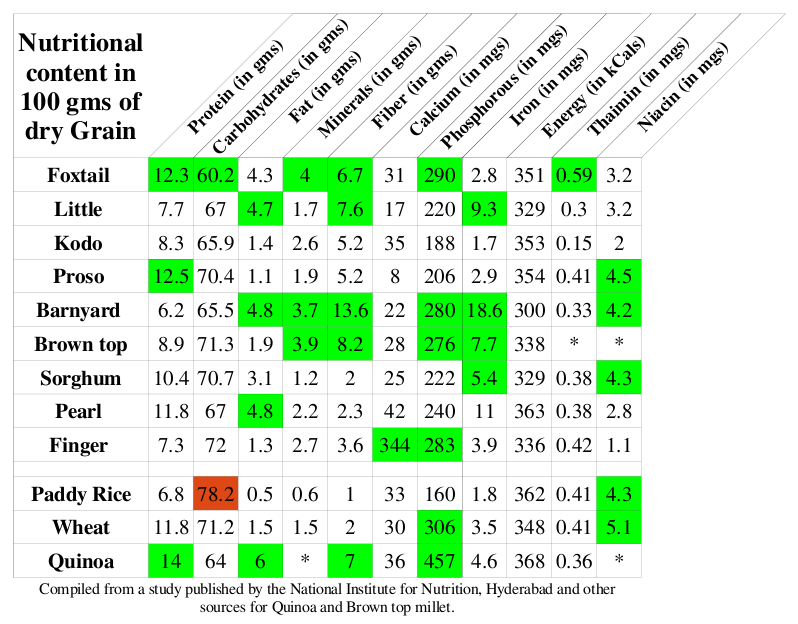 High fibre: Almost all millets have much higher fibre content than paddy or wheat. This single characteristic makes these grains a much needed addition to one’s diet. The high fiber also helps regulate the change in blood sugar levels after a meal – highly beneficial for diabetics and those with insulin issues. Filled with essential fatty acids: Millets have amazing fatty acid profiles. One might have heard about rice bran oil – the oil extracted from the bran of paddy rice. The fatty acid content in each of the millets is much higher than that in paddy or wheat and the composition of the fatty acids are way more beneficial than what is found in paddy. One has to keep in mind an important aspect of cereal grains – almost all the mineral and fatty acids and a good proportion of the fibre content is found in the bran layer. So one needs to make sure that the millet grains are unpolished, sometimes also referred to as whole grain millet rice, and have suffered minimal bran loss. Polishing millets removes the bran layer leading to major loss of nutrients. But it makes the over-all processing easier and allows for larger scale processing.